Well I get spend another day in Igloolik. My flight this morning was cancelled due to weather conditions. Apparently 50' visibility, 60 km/h wind gusts and a wind chill of -60 has caused the airline to cancel today's flight. Hopefully I'll get out on Monday. On the bright side originally I was supposed to be arriving back in Comox today but having changed my plans several weeks ago this delay hasn't turned into a logistical nightmare. Ultimately as long as I get to Iqaluit by Wednesday I should still get home Thursday. I am still planning on teaching my interdiction course in Iqaluit starting Monday but it will now start at 1:30 and run till a little later in the evening and I should be able to make up for the missed morning section. It will just mean no questions and no breaks. Well maybe a few coffee breaks. The high speed Internet I was using to upload photo's has been down for 4 days now so I haven't been able to post any new pictures. Hopefully I'll be able to add a few of Today's weather when I get to Iqaluit. (If I get to Iqaluit, maybe I am destined for a northern post after all.) Now that I've been here more than 30 days I'll have to see if staffing will show this as a transfer when I get back. Then when they come knocking I can say I've done a LDP. Well I was all set to leave Igloolik on the 3:45P.M. flight on Saturday. Unfortunately when I arrived at the airport I was told that due to mechanical problems the flight was delayed out of Iqaluit. The plane was eventually cancelled at 5:30P.M. so lucky me I got to spend another night here. Unfortunately I had packed everything away and was loathe to start unpacking things. I woke up Sunday morning looked out the window and things did not look promising. Visibility was about 200' with blowing snow. We have been hit by the first real big storm since I got here. Fortunately here its just a wind warning. 2 hours south in Hall Beach it is a full Blizzard warning so I am wondering if there will be any flights getting in today. The plane normally flies from Iqaluit to Hall Beach then here. For me I can say that today was the coldest I have experienced since being here. I nearly froze on the two minute walk from the house to the office to write this. It is currently -38 with a wind chill of wait wait -60. Personally I think that's just a little too cold. My flight today was supposed to be at noon and its currently 10:00. I should find out in about 1/2 hour what is happening with my travel arrangements. If I make it to Iqaluit today I'll be pretty surprised. If I don't well I'll probably post some sort of call for help on this blog. Well its hard to believe but 4 weeks has gone by already. Today is my last day here and I have to say I've thoroughly enjoyed the experience and I would recommend it to anyone. This morning I did my first and possibly last uniformed snow mobile patrol. We left just after 9:00 in -27 degree weather and a wind chill of -37. We headed west of town to an area where a number of locals including my co-worker Mike have cabins. It was small but cozy. We then looped around behind town and back to the office. Needless to say it took me a few minutes to warm up. The last few weeks have been busy and I have dealt with everything from thefts to an attempt robbery so there is certainly enough to keep a person busy. The weather other than being cold has been great, clear blue skies everyday and lots of sunshine now that the sunrise is before 8:00 A.M. I can hardly believe that when I got here sunrise was around 9:30. In a month daylight has increased by three hours. While groceries are on the expensive side I did not find prices completely unreasonable with the exception of pop which is now at $4.00 a can. The nice thing is you can actually get some fresh produce and fruit here and many of the locals get food mail from Quebec or Ontario on a regular basis. You order by fax and the food is shipped up. You pay approx $0.80 per Kg but it is still cheaper for many things than buying them here and it means you can get fairly fresh food. Last night I was invited to dinner and we had Pasta with fresh peppers and broccoli as well as a fresh salad. The only real downside I've found is even with two you're always on call so you can't really take off on the skidoo for a couple hours as you need to be available for backup if required. For a month it wasn't too bad but after a few months I can see where that would wear thin. I've taken a bunch more photo's and will try and upload those tonight or tomorrow before I leave Igloolik. After that I will be in Iqaluit for 4.5 days as I have arranged to instruct an interdiction course before I leave the north. Last night (Friday) There was a birthday party at the high school for one of the teachers. They opened up the gym and there was about 25-30 people there so we started out with a game of dodge ball. Now I haven't played dodge ball in a long time and it was surprisingly fun. However, they were not using the old hard rubber balls filled up to 20psi that I remember as a kid. Instead they were using softer Nerf type balls, somehow the fear factor of getting hit wasn't quite the same but lots of fun. I had thought about taking the skidoo out today but its -40 with the windchill and that's just a little too cold. Hopefully I'll get out tomorrow as it is supposed to be a little warmer and hopefully a little less windy. If you look closely you can see a halo around the sun. 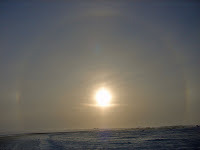 When I took this photo it was quite cold and windy causing ice crystals to get into the air and thus the halo. I am led to believe this is what is known as a sundog. If I am incorrect let me know. Saturday night is drop in Basketball at the local school. I went with Mike the other member here. Aside from ourselves there was 9 Inuit so we had a pretty good game of 5 aside basketball. We played 2 1/2 hour halves so it was a pretty good workout. Everyone was there for a good time and quite a few of the players brought their wives and kids with them. There is also floor hockey on thursdays so I'll have to give that a try this week. So for anyone thinking of coming up here there are things to do in your off time if you look around.